Keto Pre Workout | Standard and Muscle Building! Matt and I have been in a muscle building phase as of late. To promote the growth of muscle we've been testing out different keto pre workout mixes! There are some that have worked better for Matt, while others worked better for me. We not only saw changes in our bodies, but had better gym performance overall. There are two pre workouts we make in the video and list below - the standard is more of my go to (no dextrose), while Matt prefers the muscle building one. The benefit to using dextrose as a carb source, as explained in the video by Matt, is that it restores muscle glycogen as opposed to liver glycogen. There are a ton of different supplements you could use, and honestly, listing and going into all of them would take pages. The use of supplements always depends on your goals. Matt always adds in creatine to his pre workouts, which have been found to be very ketogenic. You can also play around with the ingredients provided below in terms of ratios. Finally, a lot of people make use of and ask us about BCAA supplements. While not mandatory, and probably not recommended for someone trying to lose weight, it could be beneficial for someone trying to put on muscle to have those additional amino acids that convert to protein in their body. The real question is what is your goal? Is it weight loss? If so, then maybe neither. Carbs pre or post workout won't aid in weight loss from our experience. We have found though, that carbs pre workout can aid in muscle growth as well as better gym performance! Aside from building muscle and trying to improve gym performance there are several other ways where carbs could come in handy. For many, a slightly higher carb intake could be necessary for better overall feeling and productivity - as goes with any pre workout drinks, it is always important to experiment with the types and amounts of food you eat! These pre workouts can be used to your liking and more tailored to you after some experimenting! Trying either of the ones below for a week or two and seeing how you feel can be a good way to gauge if they are something that works for you. By no means are pre workouts mandatory - as mentioned above, it all depends on your goals. If you have never tried a pre workout, however, the standard keto pre workout may be your best bet for starting off! Note: Matt found the muscle building pre workout helped him significantly with gym performance and muscle growth, while I preferred the standard pre workout. I also used less protein - anywhere from 8-10 grams - since I take in less protein throughout the day. Making the pre workout fit your goals and body is key! Also, I have never used creatine, and don't plan on doing so - as a woman I would highly suggest you do research on the supplement prior to using it! 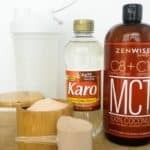 Recipe can be quickly added to MyFitnessPal - Search "KetoConnect - Standard Pre Workout"
Recipe can be quickly added to MyFitnessPal - Search "KetoConnect - Muscle Building Pre Workout"
Combine all ingredients in a water bottle or cup and stir. Take 15-20 minutes before working out! TIP: Take note of any changes you feel or see as your utilize the pre workout!